I don’t know why but when I’m baking something I don’t mind a ton of extra steps. But just cooking for a weeknight meal? Give me easy! Minimum chopping, dicing, and slicing. Minimum planning ahead. Just easy! 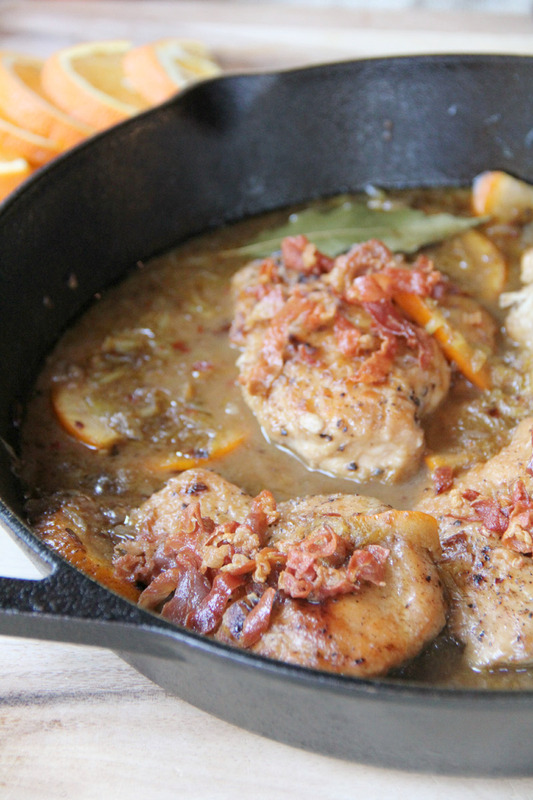 That’s why I knew I was going to like this recipe—and after tasting this chicken, I didn’t just like it, I loved it! 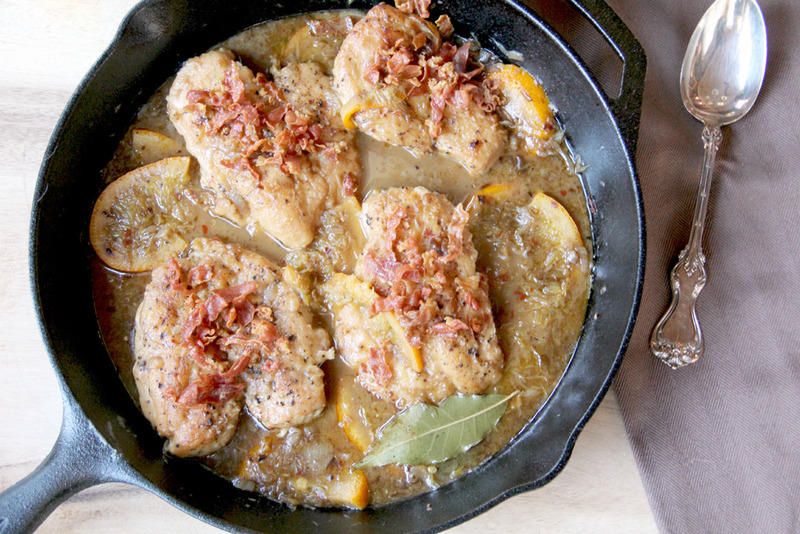 Braising is a great way to keep chicken or other meats moist and flavorful. Throw in some crispy prosciutto and you take the flavor to a whole different level. Do you go through cooking magazines every month? 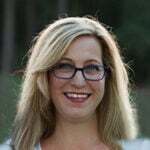 I subscribe to about half a dozen, which provide inspiration and education for this blog. Last month, I pulled this recipe from Fine Cooking thinking that it would be a lovely meal on a dreary, cold, February evening and it did not disappoint. Don’t those oranges make you feel cheerier already? The original recipe calls for chicken thighs, but since I only like chicken thighs when they are fried with Southern love, I substituted breasts instead. The only chopping or slicing involved is half an orange, the prosciutto, and a couple of shallots. Perfect! Preparation is simple but there is so much flavor going on in this dish. 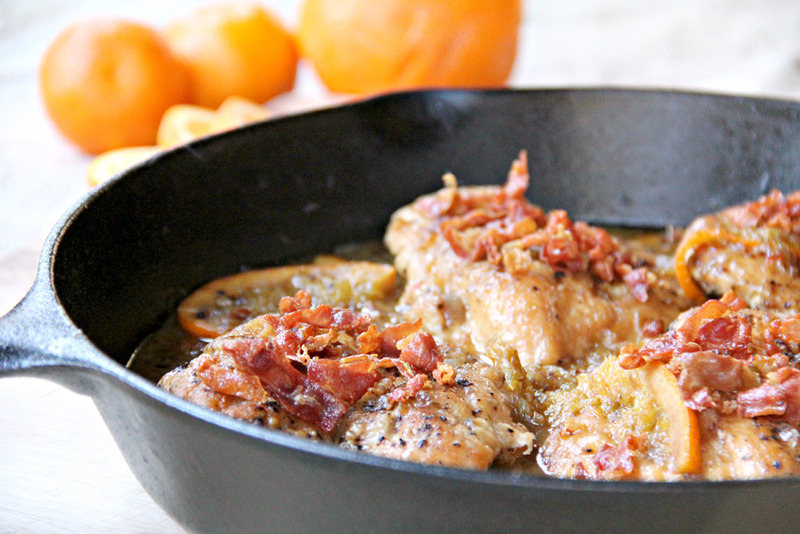 This Orange-Braised Chicken and Crispy Prosciutto is simple enough to make for your family for a weeknight dinner, but special enough for company. I would use this for a small dinner party in a heartbeat. It’s pretty and all you need to go with it is a green salad and either creamy mashed potatoes or polenta. Or keep it light and healthy and just have a salad with the chicken, which is what we did. Since there are only two of us we had plenty of leftovers for another meal and it was still delicious. Make this today, I promise you will enjoy it! 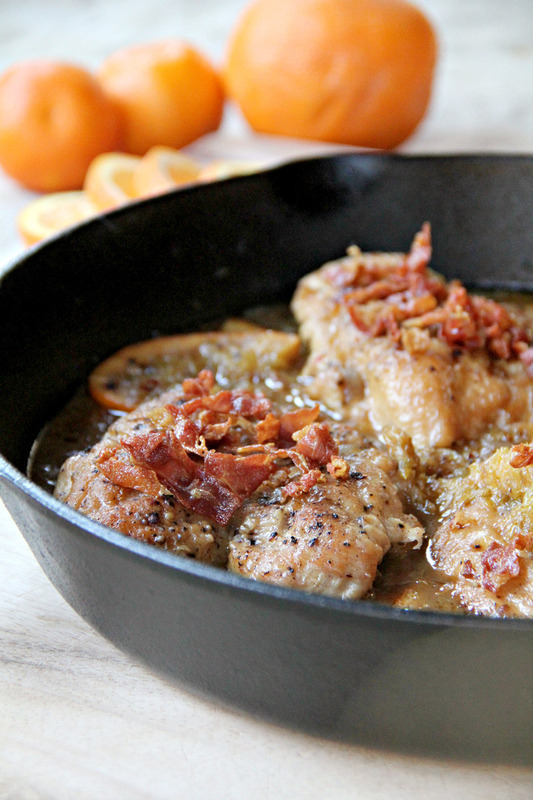 Crispy prosciutto takes this orange-braised chicken over the top with maximum flavor. It's simple to prepare and makes for an elegant dinner. Cut orange in half and squeeze juice out of one half. Slice the other orange half into 1/4 inch half moons. Season chicken with salt and pepper and dredge in flour. Heat oil in a large skillet over medium-high heat. When oil is shimmering, add prosciutto and cook until crispy, 1 to 2 minutes. Remove prosciutto with a slotted spoon to a paper-towel lined plate. Brown the chicken breasts in the skillet, 2 to 3 minutes each side. Transfer the chicken to a plate. Add the shallots to the skillet and reduce heat to medium. Stir in the red pepper flakes and orange slices and cook until shallots begin to soften, 3 to 4 minutes. Pour in vinegar, scraping any browned bits from the bottom of the skillet. Boil until skillet is almost dry. Add broth and orange juice and return to a boil. 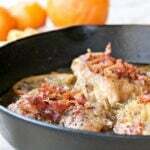 Place chicken in skillet, along with any accumulated juices. Place bay leaf in skillet and turn heat down to a gentle simmer. Cover tightly with a lid or foil. Cook about 20 minutes, turning breasts once. Season with additional salt and pepper if needed. Garnish with the crispy prosciutto. 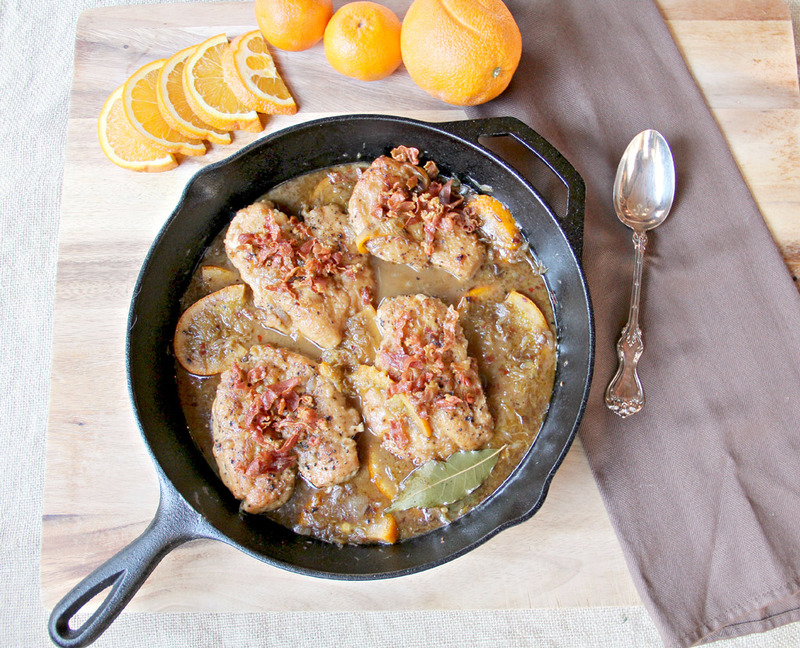 Recipe adapted from Orange-Braised Chicken with Crisp Prociutto, Fine Cooking, Winter 2015.